I have been on a chickpea roll lately here in my farmhouse kitchen in Umbria. I have discovered the joys of cooking a big pot of dried chickpeas early in the week, and then I use them in everything from salads, in pasta dishes, or in soups like this one throughout the week. 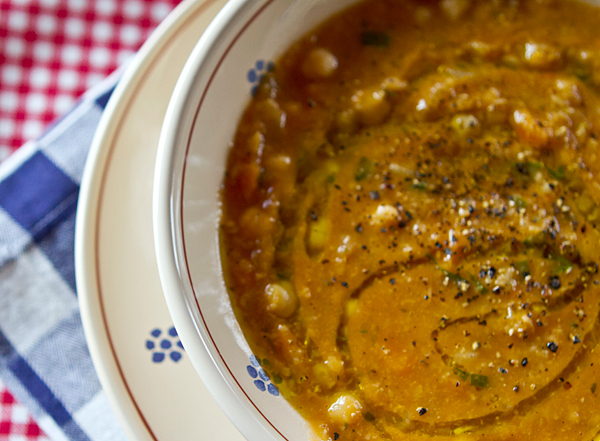 I call this my “summer” chickpea soup because although it is a hearty soup you might think would best be served in the fall, we serve it just barely warm in the summer, with just a drizzle of our own extra virgin olive oil on top. It is satisfying and delicious and just the thing on a warm summer day. You could also add any of your summer vegetables in this soup if you desired as I often throw in some chopped zucchini, or even sweet peppers. Every once in a while when we’ve had a really busy day and I am not up to cooking a big dinner, I’ll serve this soup on top of slices of grilled crusty bread along with a big mixed salad which makes a great meal. Tomatoes are an excellent source of vitamins A and C and a good source of vitamin K and potassium. Tomatoes are widely known for their outstanding antioxidant content, especially the concentration of lycopene. 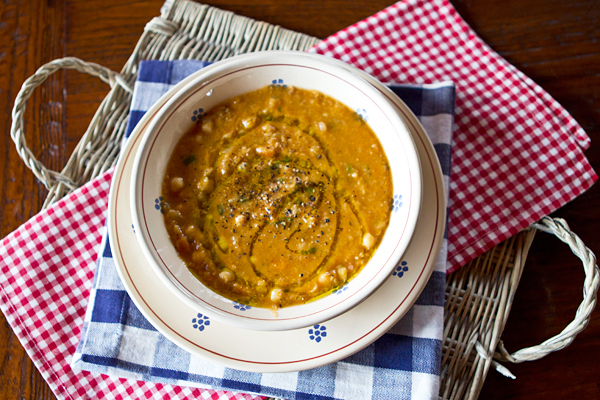 A hearty bean based soup for summer.